While out-and-about on Saturday afternoon, we stopped by Brass Monkey II. The flashing sign outside said “Home of the Mile High Bloody Mary”. Good play on words for a bar across the street from the airport. We both ordered a Bloody Mary, not sure if this indicated it was the Mile High Bloody. As the bartender made them from scratch he said “I hate Bloody Marys!” I actually loved hearing it as he made our drinks. I figured he wasn’t putting any personal ideas in and following the bars “this is how to make a Bloody Mary”. Mix: Classic! 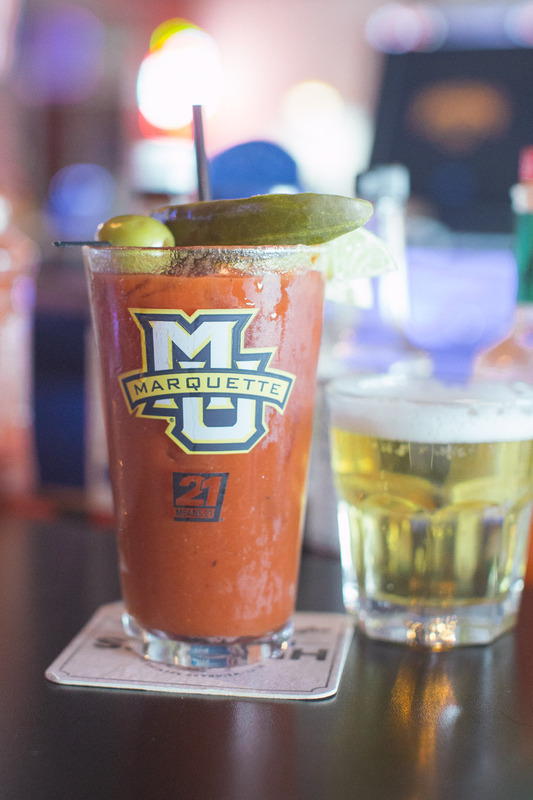 The bartender crafted this with Sacramento tomato juice, tabasco, celery salt, worcestershire, celery salt and A1. Simple and great. The mix was thick, flavorful and went down smoothly. Chaser: Domestic Taps were included, but anything outside of Miller, Budweiser and Coors were extra. I selected Coors and TJ went with Miller Lite. Garnish: Even more simple. A pickle spear and green olive. And of course, a lemon and lime wedge. Size: 20 ounce bar glass. Price: I had to put my thinking cap on for this one, you guys, and do actual math. We got a combo appetizer for $9 and our total was $18. That’s a $5 Bloody Mary. Great deal! I’ll be back! Not only for their Summerfest shuttle, but food and Bloody Marys! Their chicken wings were so great! This entry was posted on March 13, 2016 by tjuttke in Bloody Marys in the area.